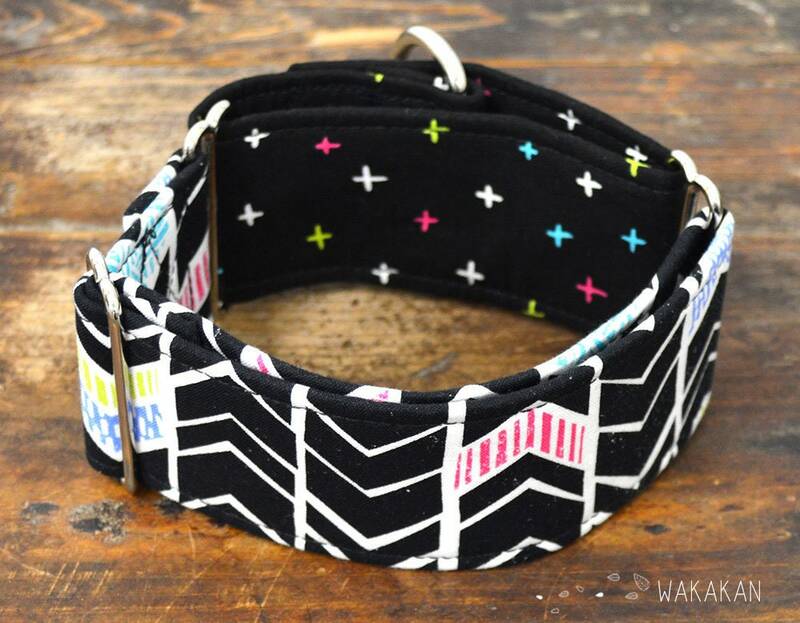 This collar is handcrafted with 100% cotton fabric, with interlining to provide firmness as well as very resistant materials. Sewn with double seams for reinforcement. Please specify the size you want when making your purchase. 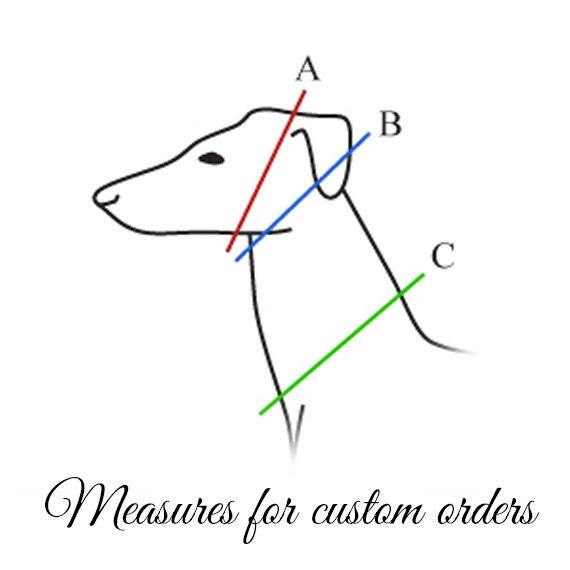 CUSTOM: If you're not sure which size will fit your dog and want us to make a personalized collar, you only need to measure your pup's neck and head as shown on the last image, and we will make it especially for them. Hand wash. Do not tumble dry. Do Not Use Bleach. • Even though we make an effort to depict the actual colors of our products, your monitor’s settings might affect how those colors are displayed on your screen. • Every collar is handmade using a random cut of the fabric, and therefore every collar is unique, and will not look exactly like the one on the picture. • Although we use high quality materials, these are not immune to the elements and will deteriorate from prolonged exposure to UVA rays and water. 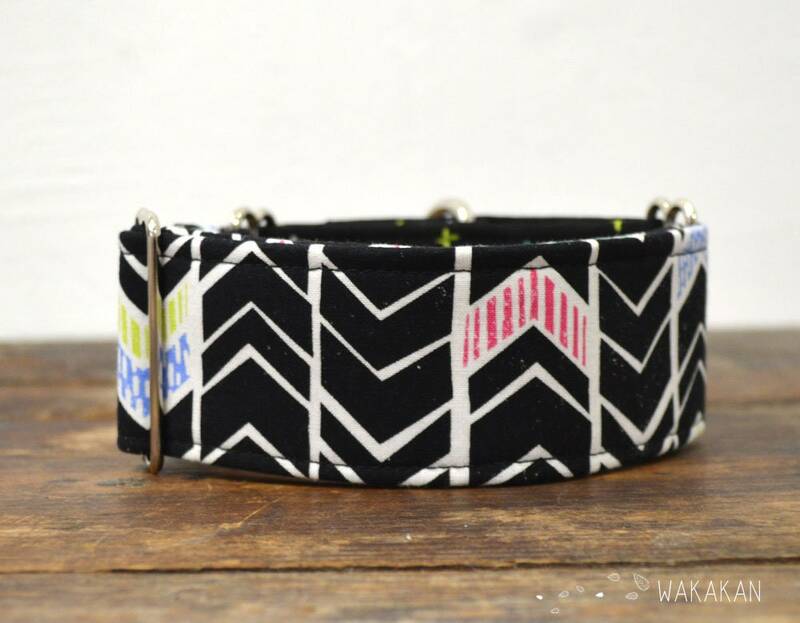 • All martingale collars in the photographs are 2” (5 cm) wide, unless otherwise noted. Orders will be paid via Etsy Checkout, since it is an easy, fast and secure way to shop. The payment must be made within 24 hours of having placed the order, otherwise it will be subject to cancellation. Before making a purchase, please make sure your Etsy shipping address is correct. From the moment we receive the payment for an order, we have between 2 and 5 business days to prepare it and send it. All our items are sent using certified mail with tracking number, so you can trace your delivery. To trace the package you must go to www.correos.es and enter the tracking number we provided you when we marked your order as shipped. CANARY ISLANDS: Customers in the Canary Islands are responsible for all duties and customs charges, and must provide us their government issued ID number, as it is required of us to provide it upon shipping. 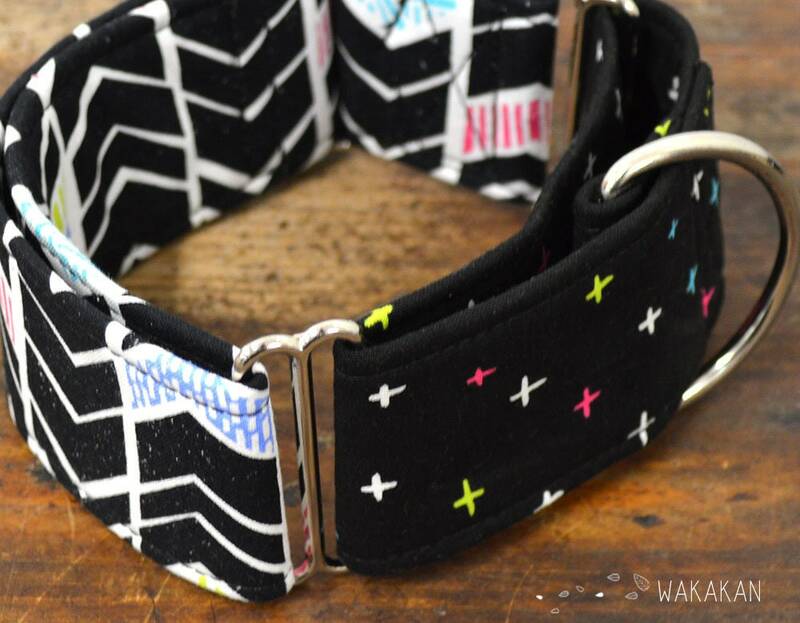 Orders of dog collars and leashes are shipped with DHL, and you can track them right here on Etsy, or by going to dhl.com and entering the number we provided you when we marked your orders as shipped. International clients are responsible for all duties and customs charges. 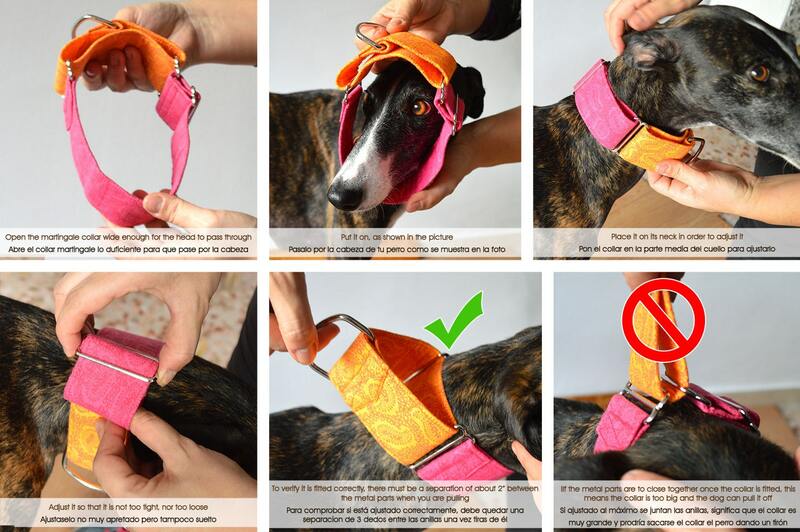 CAT COLLARS AND TOYS: these products are sent using certified mail with tracking from Correos (the Spanish postal service) however it is the country of destination’s postal service that is in charge of updating the package’s status once it has left Spain. If you are unable to see updates beyond the package leaving Spain when you enter the tracking number into www.correos.es, please contact your local post office to inquire about it. All our international packages are sent using certified mail with tracking number from Correos (the Spanish postal service) however it is the country of destination’s postal service that is in charge of updating the package’s status once it has left Spain. If you are unable to see updates beyond the package leaving Spain when you enter the tracking number into www.correos.es, please contact your local post office to inquire about it. If you would like to use an alternative, faster delivery service, please contact us before making the purchase. Our clients' satisfaction and that of their fourlegged friends is our priority, and therefore we hope you love every item that you purchase from our store. But if there is any problem with your purchase, don't hesitate to contact us to resolve it. Our collars are available in diffferent sizes. To know which size to choose, it is best that you measure your pet's neck before buying. If none of the available sizes fit them, contact us to make a personalized one for your pet. Even though we do our best to provide great quality products for pets, our furry friends are often unpredictable. We use 100% cotton fabrics for the exterior of our products, because it is softer on the dog's skin, leaving the most resistant materials (interlining and nylon webbing) on the inside to make it a safe item. For these reasons we don't use other materials. But since we use 100% cotton, it is inevitable that is suffers from wear. How it can deteriorate depends on many factors, such as how much the dog pulls, how active he or she is and how long the item is exposed to the elements. Therefore we cannot be held responsible for the deterioration that may occure from use, as well as any harm resulting from neglect, misuse, or abuse of our products. If, upon receiving an item you wish to return it or exchange it, you have 15 days to do so, as long as it hasn't been used. Shipping fees both of returning the item and shipping the new one fall on the customer. If you have any special request (size, color, design) don’t hesitate to contact us. It will be a pleasure to answer your questions. Wholesale orders are welcome, don’t hesitate to contact us with the details. 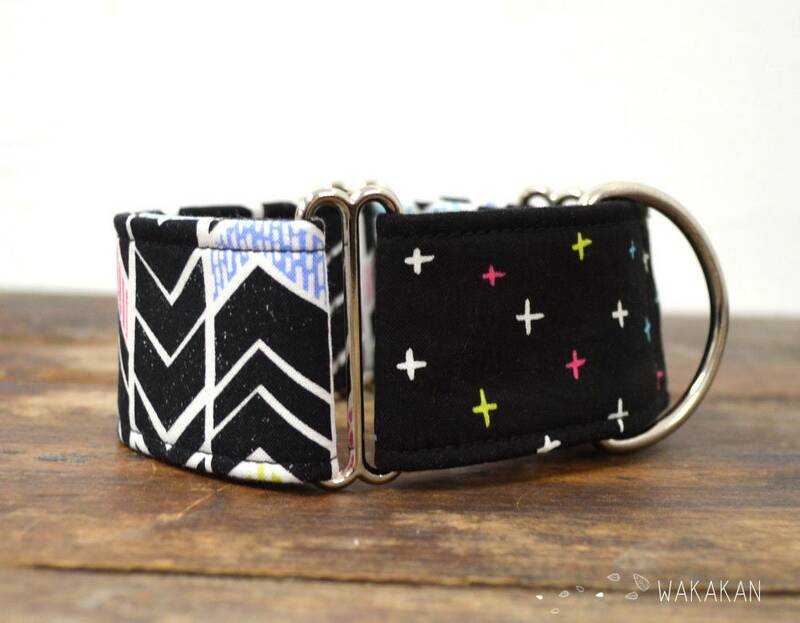 Our collars and leashes are handmade and reinforced with 4 seams, interlining and webbing, but still, any collar or leash, however durable, will eventually wear out. Please be safe and change your pet’s collar and leash when they start showing signs of wear. All our products are made in a smoke free / multi-species environment.